The famous collection of IWC is enriched with two models: Classic Chronograph Portuguese and Portuguese Tourbillon Movement Manual. 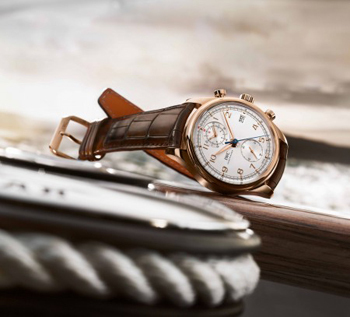 The legacy of IWC Portuguese family dates back to the precision nautical instruments with which sailors once discovered the world. More than five hundred years later, at the end of the thirties, two Portuguese traders operating in the watch industry for the manufacture of Schaffhausen landed requiring wristwatches that were supposed to work with the same precision as a marine chronometer. Equipped with a moving pocket, the first Portuguese in 1939 became the head of a family of IWC watches will enchant lovers of watches from around the world. The new Portuguese Chronograph Classic is part of this collection with a completely revised design. The characteristic applied Arabic numerals, the small type of chemin defer and thin sword hands to make that the second family of Portuguese Chronograph retains the identity and the cultural heritage of the legendary model of the thirties. The glass of the dial with accentuated curvature allows not only to reduce visually the 42 millimeter diameter of this masterpiece watchmaking, but also, highlighting the character extremely classic and variant proportionate conferred by the traditional glass. The Portuguese Chronograph Classic and equipped with the manufacture movement caliber 89361, developed for time intervals up to 12 hours of displaying an inner dial that can be read as a second clock. The sapphire crystal caseback allows you to admire the caliber 89361 as well as the rotor decorated with Cotes de Geneve. The watch is available in variants in 18 carat red gold or stainless steel, both with silver-colored dial or ardoise. The collection of watches Portuguese and renowned for being the combination of the tradition of nautical instruments of modern design and advanced mechanics. These characteristics emerge with distinction in Portuguese Tourbillon Movement Manual (ref. 5463). The Caliber 98900, perfect for large wristwatches with automatic winding, comes from a long family tree of known movements Pocket manufacturing of Schaffhausen. The case in 18 carat white gold or 18 carat red gold has a simple profile. The presence of the flying tourbillon at “9 o’clock” show without a shadow of doubt as this timepiece is equipped with components that reflect the refined art of manufacturing IWC. Thanks to the new watch glass with enhanced camber, the Portuguese Tourbillon Movement Manual is particularly flat and even more classic and proportionate. The dial chosen and coordinated at the checkout: color ardoise for the version in 18 carat white gold and silver color for the model in 18 carat red gold. The sapphire crystal caseback allows you to admire the manufacture movement caliber 98900 with three-quarter plate nickel silver plated beautifully decorated. It is inspired by the family of gauges 98000, built by the twenties. The Portuguese Tourbillon Hand-Wound, IWC’s engineers have increased the frequency of 28’800 vibrations per hour. The Portuguese Chronograph Classic and the Portuguese Tourbillon Movement Manual are equipped with a high-quality leather strap manufacturing Santoni, an Italian company specialized in family-run nuanced color of the skin. Through a complex process of finishing handmade, each strap Santoni can boast a unique patina from unique coloring. To achieve this effect, the skin surface is polished with different pastes up to achieve the desired shade and the gloss perfect. The elegant leather products Santoni are synonymous with art manufacturing finest and excellent quality. Patek Philippe Children Charity Action: Auction records!